If anyone enjoyed the just finished Life on Mars as much as I did...Good News! A sequel to TV drama Life on Mars is to be made with the action moving to the 1980s, it has been confirmed. - came to an end. The sequel, Ashes to Ashes, will see Philip Glenister return as DCI Gene Hunt - but this time in London in 1981. He will be joined by a female detective from the 21st Century who is stuck in the past after an accident. back in time following a car crash in 2006. Viewers of Tuesday's finale finally saw the answer to his continual question: "Am I mad, in a coma or back in time?" profiling to capture suspects, producers said. But when she and her daughter are kidnapped, she is injured in a rescue attempt - and finds herself in 1981. "It's a touch of Moonlighting teamed with a measure of Miami Vice," she said. Pure crap, yet strangely compelling viewing. Wonder why? Have saved the final episode as the Euro-soccer and adoc. on lunarenergy (Helium3) potential clashed.Grab a free hour tonight and finally get to the bottom of this great series. Cult status already assured. 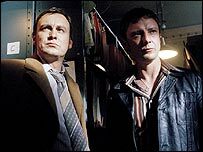 Top class performances by Philip Glenister, real bite, boot and bollock character. The real star of Life on Mars though was 1973. Very authentic characterisation. Can't see a sequel working without holding onto most of the main players, but again, not having seen the last episode....! Woohoo, I have loved this programme since it started - and while I'm sorry it's over (and frankly a teeny bit dubious about the spin-off, even though Glenister is amazing) I'm so pleased that they didn'tkeep the show going for so long that it lost all traces of what made it so good. I applaud their bravery. They've done it again... anyone seen this? satisfying. Anyone else stick with it? The poor old 'Thin White Duke' hasn't penned a winner in 20 years.